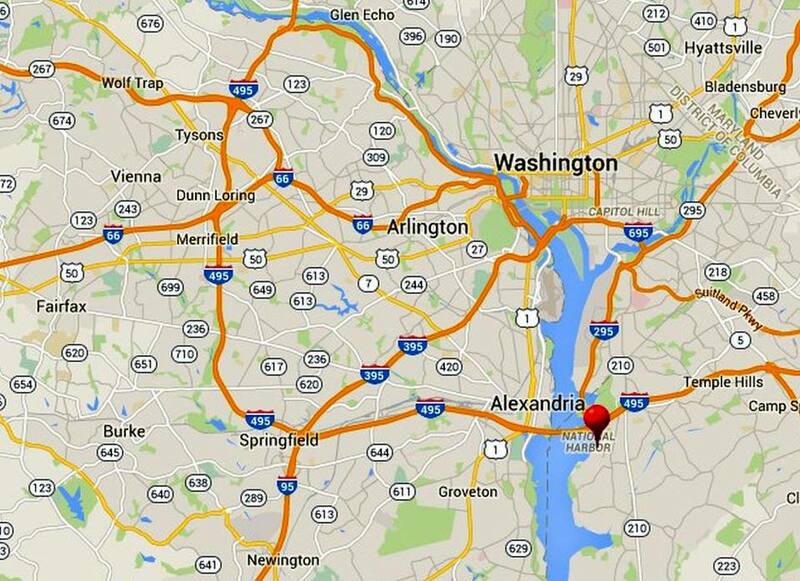 This map of National Harbor shows its location along the Potomac River in Oxon Hill, Maryland. The neighborhood is located in Prince George's County and is near Washington D.C. and Alexandria, Virginia. It is directly accessible from the Capital Beltway (I-495), I-95, I-295, and the Woodrow Wilson Bridge. The Gaylord National Resort and Conference Center, a 41.7-acre hotel and conference facility, is the cornerstone of the development of National Harbor. Tanger Outlets National Harbor are located on Oxon Hill Road, which is northeast of National Harbor. The best way to get to National Harbor is by car. There is no direct Metro station within walking distance. The resort is accessible by Metrobus, The closest Metro stations are King Street (Alexandria-Yellow Line) and Southern Avenue (Maryland-Green Line). From King Street, take the NH2 Bus. From Southern Ave, take the NH1 Bus. You can also take a water taxi to National Harbor from Alexandria. Take the exit toward Oxon Hill Rd. The MGM National Harbor Hotel and Casino is located just off of Harborview Avenue west of the waterfront. Keep left and follow signs for Harborview Ave. Merge onto MD-414 Oxon Hill Rd. If following directions to National Harbor, follow the signs to the Plateau, exiting left to Harborview Avenue and following the road to Oxon Hill Road. The Outlets are located straight ahead at the intersection of Harborview Avenue and Oxon Hill Road. Turn right onto MD-414 W/Oxon Hill Rd. Use a map to examine the layout of National Harbor and the surrounding roads: the Capital Beltway (I-495), I-95, I-295, and the Woodrow Wilson Bridge (which crosses the Potomac to Alexandria, Virginia. In addition to metered street parking, National Harbor has three public parking garages that are open 24 hours. The Gaylord National Resort and Conference Center has its own parking garage and valet parking available.